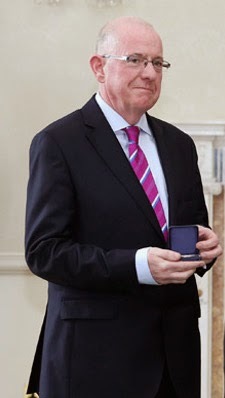 Minister for Foreign Affairs Charlie Flanagan has said Ireland abstained on a UN vote on Gaza because it wanted swifter action using mechanisms that have already been set up. The UN Human Rights Council voted to establish an independent commission of inquiry to investigate violations of human rights and it also condemned Israel for potential infractions of international law. Mr Flanagan said Ireland had spent all day engaging with its European colleagues and with other members to ensure that the result was going to be swift, workable and all-embracing. He said that Ireland acknowledged that this did not happen, but it was going to work within the structures as agreed because the objective is to ensure a ceasefire at the earliest opportunity and an end to the unacceptable level of violence and killing. This is not the way to proceed Charlie. Your very first action if your words are sincere should have been to remove the Israeli Ambassador, but then you are not a very brave man are you? Secondly you and your EU cronies ought to have put forward a mandate stating that you wanted immediate action. Too late now mate, you just sound like a weak apologist and let's face it some of your EU mates sell arms to Israel (especially Britain whose morals are to say the least are very dodgy). The British are one of the worlds largest arms dealers and manufacturers of weaponry. That's what their economy is based on Charlie. 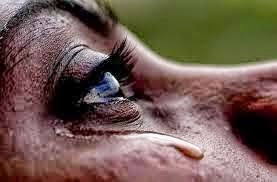 How many more tears must flow ? 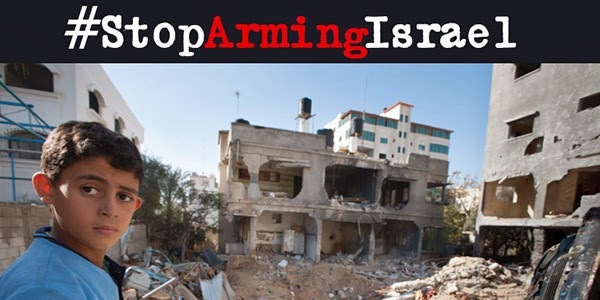 If the US funding of four billion dollars a year, which is used to destroy homes, to build settlements and to bomb Palestinians, were cut off, Israel probably could not last a day. It’s only US money and support for Israel that keeps the colonial project going. Again, the divestment movement in the world is very important. We need to see it grow. 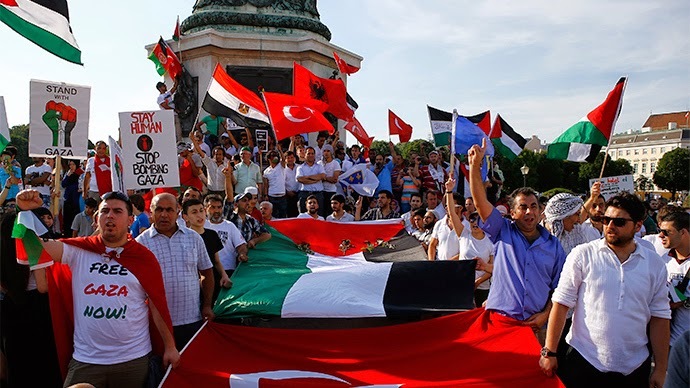 The people of the world must stand up and demand that their governments stop support for Israel . Our hearts go out to the Palestinian people, to the children, the women, the men, to the resistance fighters, to all of Palestine. 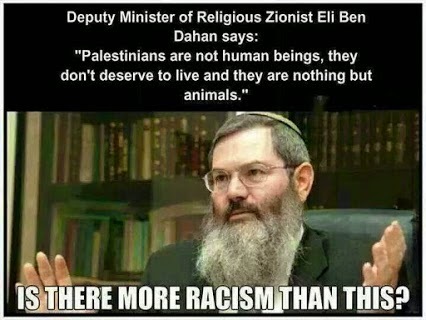 There is a phrase that Zionist Israel has adopted and in doing so corrupted for their own use. Semitic people and so the words do not apply to the total population of Israel. For Semitic refers to a race of people. Traditionally, the Semites are people who are descendants of Shem. Semitic is a major branch of the Afro-Asiatic language family. The Afro-asian language, Afro-asiatic language and Hamito-Semitic are a large family of related languages spoken both in Asia and Africa. - Amharic, the Ethiopian language, the dominant and official language of Ethiopia; a Semitic language much influenced by the Cushitic language with which Amhara have been in close contact. - Arabic language, the Semitic language of the Arabs; spoken in a variety of dialects. - Aramaic, a Semitic language originally of the ancient Arameans but still spoken by other people in southwestern Asia. - Maltese language, the national language of the Republic of Malta; a Semitic language derived from Arabic but with many loan words from Italian, Spanish, and Norman-French. - Cananitic language - a group of Semitic languages. Standing up for human rights for Palestine/Gaza is not anti-Semitic because those people are Semitic. 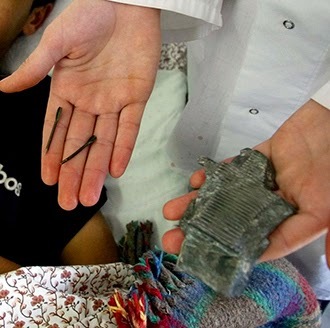 The Zionist Israeli military has been accused of using flechette shells during its offensive in Gaza, which can cause widespread harm and death to civilians. These shells are only four centimetres in length and contain thousands of small darts, which are released when the shell explodes in mid air. Normally fired by tanks, these munitions, though legal in Israel and internationally, have been slammed as inhumane by rights groups. Nahla Khalil Najjar, a 37 year-old women, suffered injuries to her chest. PCHR provided a picture of flechettes taken by a fieldworker last week as reported in the Guardian newspaper. CONTACT YOUR POLITICAL REPRESENTATIVE or THE AMERICAN EMBASSY. REFUSE TO SUPPORT THE ISRAELI ECONOMY BY BOYCOTTING THEIR PRODUCE. DONATE FIRST-AID KITS, NAPPIES, CHILDRENS’ TOYS AND BOOKS TO THE “TOYS FOR GAZA” SHIP. BETTER STILL DO THEM ALL ! On Sunday we made arrangements to visit a friend on the East coast and rather than use the motorway to Dublin we decided to go cross country, using the small slow roads to admire the scenery. All was going very well until an incident took place which meant that we were delayed for one and a half hours, so we cancelled the visit to our friend. Feeling the need for refreshments we headed off for a coffee to a small village which sits at the foot of Slievecorragh -‘rocky or rugged mountain’. On the summit is a sculpture of a kitchen chair, inscribed with the name Dan Clancy, a young man whose home was at the bottom of the mountain and who would frequently climb up there to see the sunset. 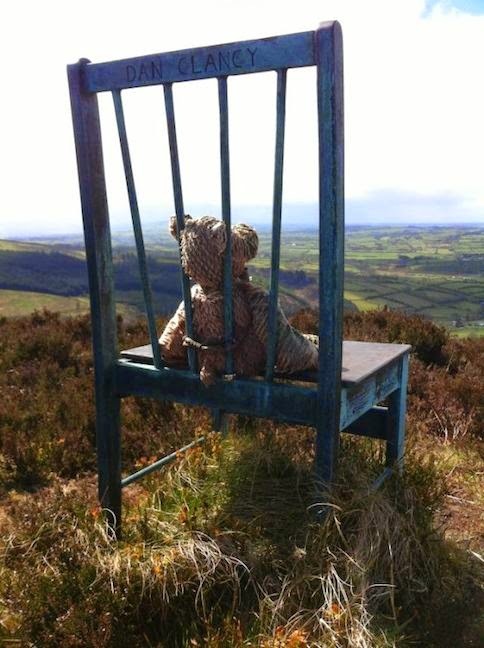 Sadly Dan died in New York of cancer aged 31 in February 2004 and the chair with its’ teddy bear is a memorial to his life and love of the mountain. 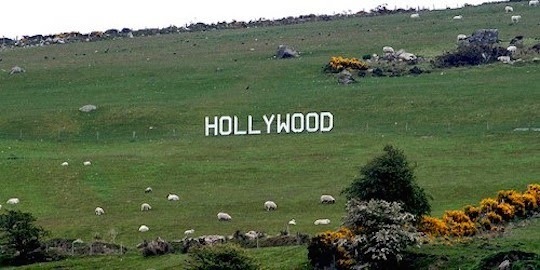 On the lower slopes of Slievecorragh, written in large white letters, is a very familiar name-place which in Irish is Cillín Chaoimhín, better known as Hollywood. It was from this place during the Great Famine of the 1840’s that Matthew Guirke emigrated to the USA and on to California where he became a successful business man. He gained further fame by naming a suburb of Los Angeles with the English name of his former home and so Hollywood was created. The village has a long association with 6th Century Saint Kevin and many pilgrims once passed through following in his footsteps, on their way to the monastic settlement at Glendalough. A great Inn for refreshments. With our coffee break over we drove along an almost continuous climb to a ridge called Windy Gap in the Wicklow Mountains. In the sizeable car park Mrs H took the camera for a brisk walk in a cool wind to take photos of the views, whilst I sat in a meditative state enjoying a pleasing pipe of the aromatic Clan tobacco, with the front window down to watch the comings and goings of the tourists. From The Gap we drove steadily down the mountain as it is very steep and twisty in some parts and one can’t be too careful, especially when there are wild young Dubs and scenery gazing tourists around each bend. Our next stop was at The Meeting of the Waters for more refreshments, by which time my tongue was crying out for a cup of strong black tea with a dash of milk to ease it down. We sat outside in warm sunshine listening to the different accents of the customers, many having travelled down from the North as this was Marching Weekend. Known as ‘The 12th’ this is a time when quite a few people take the opportunity to come down South and we are very glad of their company - and their money in these hard times! Above the confluence of the two rivers is a pub of the same name and set in the wall a relic of an earlier time, a post box from the Victorian era. It has always been my custom, when on day trips, to make the return journey on a different route, as far as possible, than the road out. So it was that Mrs H, my trusty navigator, brought us home avoiding the cities and towns, on a scenic road that led past a Neolithic dolmen which stands on a bank of the River Greese. Unfortunately there was nowhere to park so we had to keep going but we have it marked and shall return to take photos one day. On our return home, after a journey of 193 kms (120 miles) I was pleased to see that my economical driving had only used up a quarter of a tank petrol, approx 12 litres (2.5 UK gallons) - not too bad for a sixteen year old Starlet that had travelled to Hollywood and back! For approximately ten months I have been holding a secret about taking part in a section of a documentary film concerning the Celtic god, Lugh. 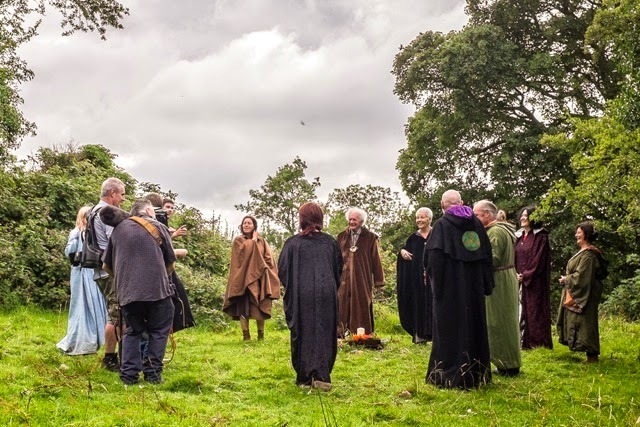 The druid grove to which I belong celebrated Lughnasadh in foothills of the Slieve Bloom Mountains and the production company who engaged with us, TILE FILMS of Dublin, were patient and respectful of our ways. The film crew in discussion. 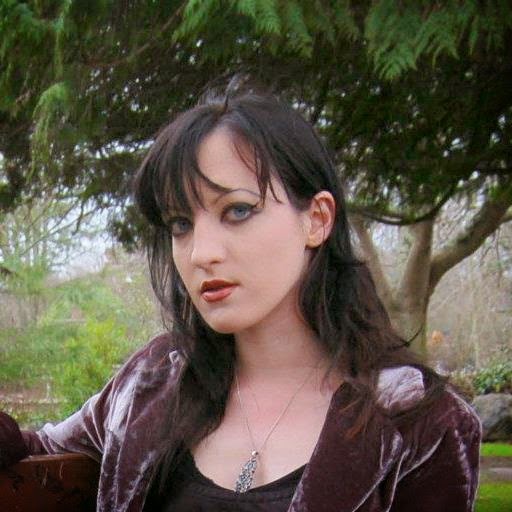 All of this began when a good friend of ours, the folklorist Dr Jenny Butler asked how would we feel about the grove being filmed at one our rituals. After deliberation we decided to take part in the film as we felt that it would be a unique blend of Irish mythology, sacred sites, archaeology and scientific exploration. We normally do not allow sightseers to watch us, preferring to maintain the privacy of members and not to be distracted by camera flashes, so it was a major decision for us to give permission for the filming. We stipulated that the camera crew could not enter the circle whilst we were celebrating the actual ritual; however, we were willing to re-enact whatever sections they wanted to record afterwards. 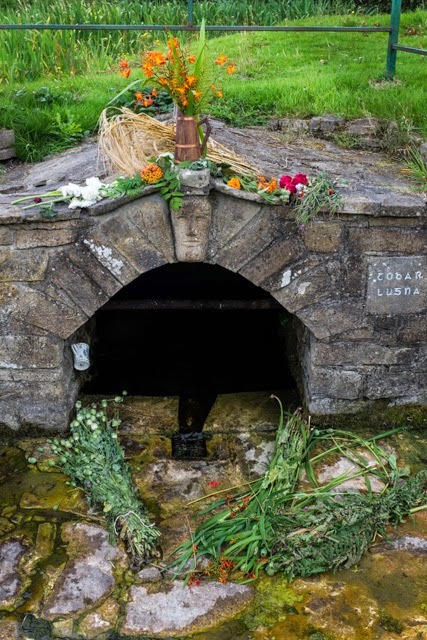 The traditional Lughnasadh site in our area is on Arderin (Height of Ériu) in the Slieve Bloom mountains however, after surveying the area with the production team a few weeks prior to filming we chose to work at Tobar Lugna (Lughna's Well) in the foothills, near to the village of Cadamstown. This location fulfilled all of the requirements having light, silence and easy access for all concerned. It was at this site that our pre-christian ancestors venerated the clear water at the well which is still believed to hold a cure for eye ailments. Later, in christian times, the oratory of the little known St. Lugna was built here, the remains of which can still be seen. 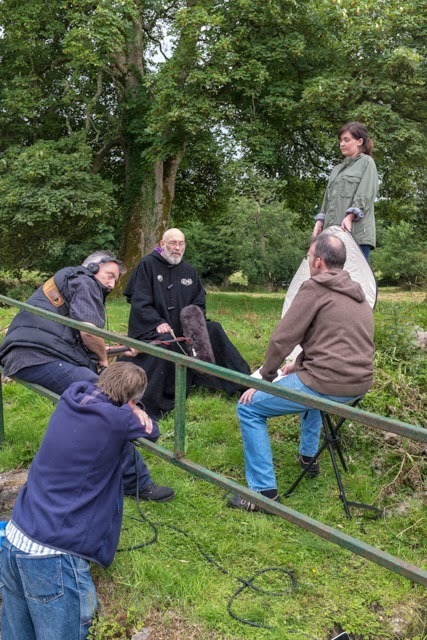 Filming started at 10.00 a.m. and for Fred, our oldest druid, a good few hours earlier when he and the film crew visited a Bronze Age burial mound in a valley on the eastern slopes of Knocknamann (Hill of the Women), which was a Bealtaine ritual site. 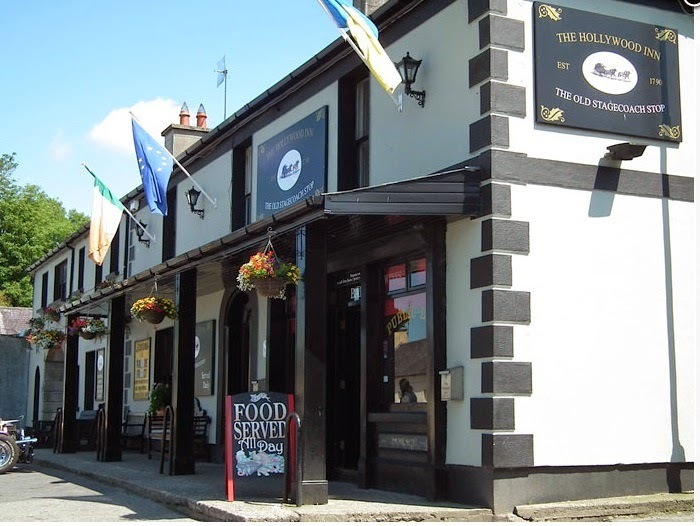 Beneath it's western slopes sits the small town of Kinnitty in Co. Offaly where the lads had lunch prior to our arrival on site at 2.30 pm. Twelve druids, seven women and five men, from the four provinces of Ireland, assembled on a level piece of land where the earth energy was strongest. We were bordered in the north by a line of whitethorn trees, in the east by a stand of old ash trees and in the south on a higher level, the remains of the oratory, whilst below us to the west, flowed the waters of the well. Our preparations began by dressing the well with flowers, followed by placing on the land the first fruits. We went silently down to the well and walked around it sun-wise nine times before a woman druid filled our cup with its water and led us back up to the harvest. We circled the earths' fruits and in silence constructed a sphere of energy combining the realms of Sky, Land and the Watery Underworld and went on to celebrate Brón Trogaine. The original name for Lughnasadh was Brón Trogaine (pronounced Brune Trown) which means something like 'the earth sorrows under its' fruits' and describes the earth giving birth to the harvest. The name for this festival changed later to Lughnasadh when it was attached to the god Lugh with the 'nasadh' part of the word meaning games or assemblies. Lughnasadh was the time when the great gatherings of the tribes were held and presided over by the local king. The most well known one was at Teltown in Co. Meath where Lugh was said to have introduced games and horse racing in honour of his foster mother, who died there. These Lughnasadh gatherings were also a time for trial marriages and law making. In nature Lughnasadh marks the appearance of the first fruits of the year and in ancient times, when people relied on food collected in the wild, it began the start of the harvest season. In Ireland the festival was often celebrated at high places where the land was seen to meet the sky and the goddess to meet the god. These places also gave a view of the surrounding landscape and other peaks where Lughnasadh was being marked. It is thought that the ancient pagan celebrations took the form of offerings of grain, flowers and berries to the gods. Today, we druids celebrate this time with a ritual to honour the goddess of the land, Ériu and her gifts to us, the harvest of fruit and crops. We also honour Lugh the god of light. Our ritual connects us to nature and to the spirits of the place and in silence we take time to listen and harmonise with each other. A powerful part of our ceremony is the sharing of water from the well when the cup is passed around the circle. Later the grove members share what Lughnasadh means to them individually and what each hopes to harvest in their lives. Our ritual ends as we kneel to place our hands upon the earth. An interview with Mel after the film. The derivation of Lugh may have its roots in early words such as leuk, 'light', or lug, oath. In myth his titles include Lámfhada, 'Long Arm'. Samhildánach, 'Equally Skilled in Many Arts' and Lonnbeimnech, 'Fierce Striker'. The Milky Way was once known as Lugh's Chain and these descriptions suggest that in Ireland he was not viewed as a sun god rather he was associated with light, the night sky, lightning and storms. Summer storms, when lightning strikes the land, was welcomed by farmers as it increased nitrogen in the soil thus producing an better yield of crops, so Lugh as the 'Fierce Striker' would have been welcomed by the community. Another title of Lugh, found in old manuscripts is 'Lethsuanach' meaning he had "red colour on him from sunset to morning" and he is described in one story as "coming up in the west, as bright as the sun, with a long arm", leading Prof. Mike Baillie to suggest that Lugh was in fact a red comet which appeared over ancient Ireland.